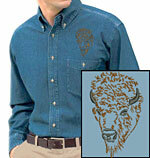 Men's Denim Shirt with Bison - Buffalo - Embroidery Portrait #3. The 7 oz. 100% cotton denim stonewashed shirt has left chest pocket with button, yoke back and button down collar. The embroidery design is about 3" (75mm). The light and medium indigo shirts are sewn with black embroidery threads. The dark indigo colored shirts with white embroidery threads. Please choose Shirt Size and Color from the dropdown lists below. The Font Style you choose will be applied to all the custom text you order. This product was added to our catalog on Tuesday 20 December, 2011.